The Irish Aerial Creation Centre (IACC) is a place for people to unlock their creativity and and for 4 years we have taught people to fly. 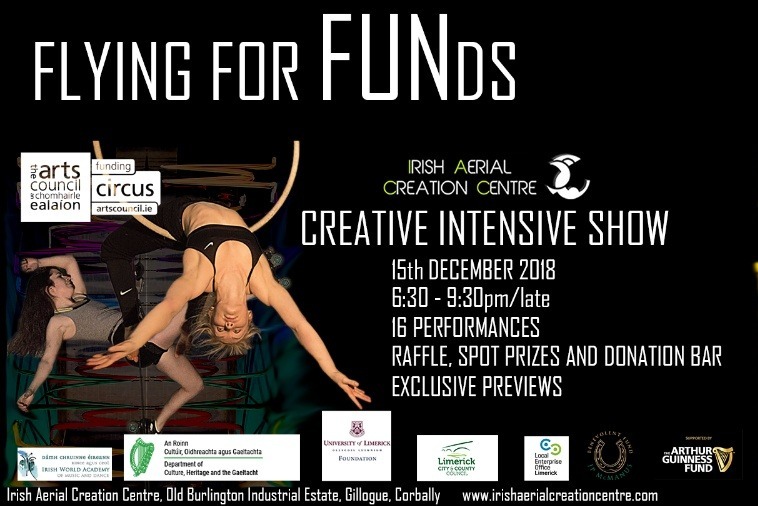 IACC is based in Burlington Business park in Gillogue and it is Ireland’s first purpose-fitted space for aerial dance and home to Fidget Feet Aerial Dance Company the founders. Everyone wants to fly, so come join us and help us to ensure the IACC stays open and continues to be a home for all walks of life in your community to learn, create and fly. We are holding our first ever fundraising event on Saturday 15th December in IACC at 18.30-21.30/late, with amazing aerial performances from international aerialists followed by DJ, so we can dance the night away. There will be goodies and surprises on the night so don’t miss this fun pre-Christmas event.